The challenge for this year’s Halloween party was to find a “B-rate” superhero or villan. No superman, spiderman, ironman, or other mainstream nonsesne here. We had to come up with something unique and not-mainstream, so my answer was clear. 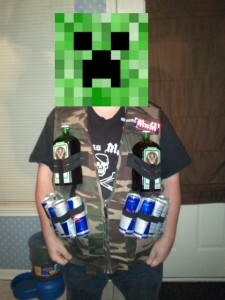 I present to you the Arduino powered Jagerbomber, complete with countdown timer. This costume served me quite well, winning both the party’s “Best Male Costume” and later on at work, “Best Costume” so I’m sure it’ll give you some good ideas for next year! Remember, only 363 Days till Next Halloween! Every year, a good friend of mine throws an invite-only Halloween party. This year’s theme was “B-rate Superheros and Villains” as outlined above. The concept was simple enough, but we still had to figure out what I could do. 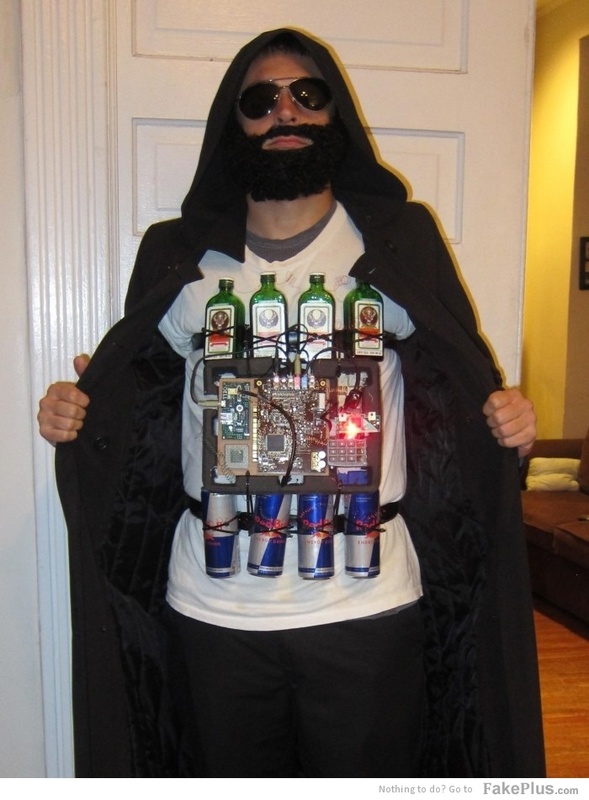 After talking with several friends, I decided on the Jagerbomber, mainly because I like to drink and since this was an alcohol-friendly party, I was sure that it would go over with a fair amount of success. I thought the setup was good, but his design had something mine didn’t. He had the lapel pin. His actually looked like it was going to blow up someone’s liver. My friend then said, “Yours looks cool, but you need something to take it over the edge, add some LEDs to it or something.” So with that challenge (and a party in three days), I set off to see what I could muster up. I didn’t want to feed any stereotypes with my Jagerbomber costume and felt the one above was a little too Middle-Easterner for me so I decided that I would use a standard hunting vest as a base and build off of that. I was able to score a decent hunting vest at Academy for around $12.00 and found some black elastic banding at a sewing shop. I decided that while the guy had used four small glasses, I would use two 1 Liter bottles (I ended using a 1L and a 1.5L bottle) and instead of four Red Bull cans, I would use ten. I planned to drink myself to oblivion, so using empty redbull and jager bottles (like the photo above) was simply not an option. What’s a jagerbomber with a non-functioning suit? To secure the black elastic to the hunting vest, I used my wife’s sewing machine (and didn’t burn the house down). 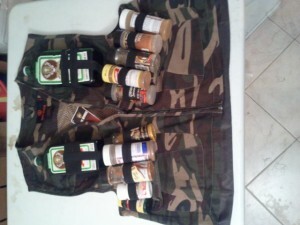 I chose a “T” formation for the two jager bottles (one strap runs across, one strap runs from the other and secures at the bottom) for the two bottles since they were bulky and heavy. The RedBull cans stayed well with just the single loop across the middle. On each edge of the “T” straps and at each end of the Red Bull straps, I made sure the strap was secured by sewing in a box , with an X in the middle of it, to ensure that if the seam started to rip, it would have enough of a seam to hold at least through the party. Below is the modified Jagerbomb vest with spices acting as placeholders for the Red Bull. After getting some constructive feedback about no flashing lights, I decided to rig up a display. Thankfully, my DealExtreme order came in from earlier and with it, came this lovely item. This is an eight digit seven segment display module that also includes eight pushbuttons and eight bi-color LEDs. This is an absoloute steal at $6.99 and I highly recommend this module, even if you don’t need to make a Jagerbomber costume. I also used an Arduino Uno to drive the display and a cellphone recharger battery pack. The battery pack and the Arduino would go in a pocket and would run indefinitely while the display would be sewn into the vest right at “name-badge” level on the left shoulder just above the bottle of Jagermeister. A small cable (extended with jumper wire) would run from the Arduino to the display and would follow the seams for easy sewing. I didn’t want wires going all over the place. I managed to get the display and the wire soldered into place but I had no way of protecting the Arduino fully. If I were to do this again, i would get a temporary enclosure for the Arduino, even a small cardboard pocket box would work. As far as battery consumption, the cell charger pack is three years old and it can still charge a phone from dead to mostly charged (high 80%) and during an 8 hour workday , it still had about 80% of its charge left. I use it to charge my cellphones and it’s great, especially when I forget to plug my cellphone in. The code for this is pretty simple thanks to the hookup information and library guide at TronixStuff and the TM1638 library located at Google Code. – Attraction mode: does what its name says, it counts up from power-on and keeps going. The bi-color LEDs on the front alternate red and green while it is counting. – Countdown mode: This was the fun part. Hitting any one of the leftmost 5 buttons when the bi-color LEDs are green started a counter that ran from a pre-set value to zero. Once it hits zero, it starts flashing and displays “SHOTS”, and if you’re at the right party, everyone takes a shot. The left 5 buttons are set up in 20 minute, 10 minute, 5 minute, 1 minute, and 10 second intervals. The other three buttons do nothing. Love the outfit! That is a clever idea. How did you come up with it? I did a screw driver once and dressed up as a screw driver and held vodka and OJ. That was cool. Hope to hear from you soon. Thank you for your support! As much as I’d love to take the idea of the jagerbomber, it wasn’t mine originally. I just felt that I could do better than the ones I have seen online. I love the idea of a screwdriver costume and now I want (well the vodka+OJ version anyways). I get a 1 for the first button but nothing for the rest.